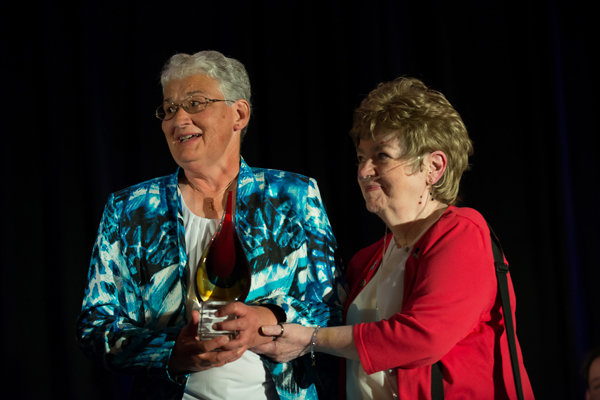 Jeannette Morrill of Shirley (left) was honored in June in Florida with the Outstanding PH Citizen Award given by the Pulmonary Hypertension Association for her work to raise awareness of the disease. Presenting the award is Merle Reeseman, a PH patient from Pennsylvania. FALMOUTH, Maine — Jeannette Morrill of Shirley is on a mission to raise funds for and awareness about pulmonary hypertension. She was diagnosed with the illness in 1976 when she was 23 years old. The outlook for recovery was not bright then, and she was told she might have two years left to live. She credits the development of a new medicine and the care of cardiologist Dr. Joe Wise with saving her life. In the ensuing years, Morrill returned to teaching and adopted two sons, though the disease continues to send her into health crisis from time to time. Still, she finds the energy to lead support groups in Bangor and Portland for others with the disease, and to organize the sixth annual PH Forum and Swinging for a Cure Golf Tournament set for Friday and Saturday, Sept. 14-15, at the Falmouth Country Club. The forum will begin with registration at 8:30 a.m. on Friday. The first session will begin at 9 a.m. with Dr. Joel Wirth and Dr. Hap Farber discussing new treatments for the illness, stem cell research, transplant issues and medical trials in Portland and Boston. Other talks will focus on traveling, oxygen use, caregivers and living with the illness. Information also will be available from the Pulmonary Hypertension Association and the UPHill Journeys program, founded by patients and caregivers in Maine and New Hampshire to support those with the illness. The forum is free. Also on that day will be a balloon release to honor those who have lost their lives to the disease. “I hope family members who lost loved ones to PH will contact me so they can release a balloon in memory of that person,” Morrill said. The golf tournament will begin with registration at 11:30 a.m. on Saturday. Tee-off time will be at 1 p.m. A live auction and a buffet dinner also will be part of the event. Registration fee is $100 per player. Morrill was honored in June in Florida with the Outstanding PH Citizen Award for raising funds and awareness about the illness, and for advocacy for the Tom Lantos Pulmonary Hypertension Research and Education Act, a bill being considered for passage by Congress. “That was over the top for me. Thirty-six years ago there would not have been anyone in that room. That day there were 1,500, a result of raising awareness and so much education about the disease,” she said. Morrill also is the author of “Living with PH: 34 Years and Counting,” self-published in 2010. Copies are available by calling or emailing Morrill. The cost is $15 plus shipping. Nine dollars from the sale of each book will be donated to the Pulmonary Hypertension Association and the UPHill Journeys program. To donate items for the auction, to register for the golf tournament, to release a balloon in memory of a loved one lost to pulmonary hypertension or for information, email Morrill at jmmorrill@gmail.com or call her at 695-3042 or 689-1170.